We’d love your help. 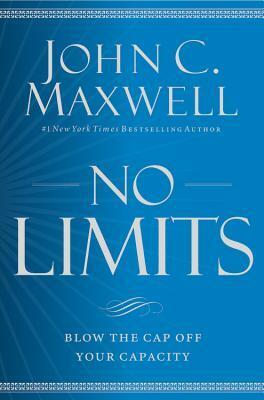 Let us know what’s wrong with this preview of No Limits by John C. Maxwell. To ask other readers questions about No Limits, please sign up. I have long admired Mr. Maxwell and his amazing ability to teach lead and dig down to the crux of the subject. His insight is amazing and as I was reading this book I realize that he is the type of person that never stops wanting to better himself or others. I admire that and know that is something I have to work on. I often feel frustrated in my business because I feel like it gets to a certain level and then stumbling blocks are put in my way. While this is a typical scenario for every business I have long admired Mr. Maxwell and his amazing ability to teach lead and dig down to the crux of the subject. His insight is amazing and as I was reading this book I realize that he is the type of person that never stops wanting to better himself or others. I admire that and know that is something I have to work on. I often feel frustrated in my business because I feel like it gets to a certain level and then stumbling blocks are put in my way. While this is a typical scenario for every business, I often give up or start over and then feel the same frustration again. This book opened my eyes to many different areas of this issue as he spoke about the capacity and how much we can accomplish in our life and in our business. I took many many notes and I love the fact that at the end of each chapter there are three questions to help you dig down into things you need to adjust and work on. Mr. Maxwell is extremely well-known for his amazing books. And No Limits is one that is loaded with the insight to bring clarity into your own life. I didn’t just get a nugget of a good takeaway. The whole book is a great takeaway and can change so much in your life. This is definitely a book that you will reread again and again and find more amazing knowledge that can make impact in your life. That is my plan! This book was required reading at my job, and it was well worth it! It is just shy of five stars for me, and I look forward to re-reading parts of it in the near future. The book was interesting, thought-provoking, practical, helpful, and well written. John Maxwell has written dozens of books and sold millions of copies, and yet he hasn't run out of good material to share with the world. It's clear to see that he really cares about others and is writing because he genuinely wants to help others g This book was required reading at my job, and it was well worth it! It is just shy of five stars for me, and I look forward to re-reading parts of it in the near future. John Maxwell has written dozens of books and sold millions of copies, and yet he hasn't run out of good material to share with the world. It's clear to see that he really cares about others and is writing because he genuinely wants to help others grow and become all they can be. I choose to read No Limits Blow the Cap off your Capacity by John C.Maxwell because I do strongly believe in the capacity of every man or woman to be successful in this society. And yes I think that there are no limits although sometimes there are many limits for most of people and John C.Maxwell will help the reader to discover his/her potentialities, suggesting which ones are the strongest caps that must be removed for becoming successful for most of us. The book will be released this March 7th I choose to read No Limits Blow the Cap off your Capacity by John C.Maxwell because I do strongly believe in the capacity of every man or woman to be successful in this society. The book will be released this March 7th and it is absolutely interesting for everyone. It is written for people of success not tired to become more successful, but of course the advice shared in this book can be great for every reader. each of us can become a best person. First of all Mr Maxwell writes that for becoming more successful in life it's necessary to remove some caps from as said before. Which ones? All the ones not dictated by the birth of the person. There are caps that won't never be removed. Our parents, relatives, birthplace, the sum of it gives our history. All the rest of caps are of two types: the ones created by neighbors and so-called friends and the ones created by us. The work that we must do is to try to destroy these caps for create a best self and a person conscious of his/her value. In the second part of the book Maxwell analyzes all the capacities each of us possess: energy capacity, emotional capacity, thinking capacity, people capacity, creative capacity, production capacity, leadership capacity, in the third Maxwell will write about Choices, and how we can maximize our capacity. Mr Maxwell analyzes all these aspects in detail and at the end of every chapter you will find some questions/reflections for you. A leader and a person with a good personality will be in grade to focus on other people for building great contacts, without to forget to be visionary. Looking forward it's important for every successful person. Without the vision of the future, an organized, logical and structured future it's impossible to create. A person of success won't think just "the now" but the future of his structure and/or company. No one can define us and no one including ourselves should put down our self. Maxwell brings the example of a famous motivator Nick Vujicic without legs and arms. He could have lived devastated because of it, but he choose to live a plenty and a successful life. The most positive men are the ones who, without any doubt trust others, have a lot of friends and connections because they know that these connections are of mutual help: these men/women become best people thanks to them and friends and connections receive help from them. The best leaders are the ones able to see the future before its arrival. An example the one of Ford. Ford thought that maybe life of people would have been better with, well, a car in every house. People of course skeptical because who can see the future is not appreciated and believed. At that time Ford started a real revolution for the society and for the world. Cars simplified a lot the hard life of people reducing distances between cities, saving time. Mr Maxwell writes that no one can build a great future if a person doesn't take any kind of responsibility. Responsibility means respect for ourselves and the others. Maxwell speaks also of bad people in our life. People who can sometimes work not necessarily for helping us but the opposite. These people once recognized must be removed from our circle of friends, although we must remaining positive and thinking that it's necessary an expansion of friends and connections, because with them we can grow. It's important to stimulate people, being helpful for them and vice-versa. It's also important to remember the best moments we are living in this life, creating unforgettable memories. I loved the anecdotes of the journal written by the author to his wife. Touching. Maxwell remarks that a person never, never should think that age can be an obstacle. Mr Maxwell is 70 years and he tell that there is no limits for our person and our personal growth, and that we can learn, appreciate life, better us, continuously, without any kind of interruption. Sure, add Maxwell changes are fundamental because in opposite case nothing can be possible for improving and becoming someone else, the real person that sometimes it's hidden in ourself because very comfy to do that. Not risking, not trying, not living after all is better than to be fully alive for some people but these people will always remain behind if they won't change their attitude. Mr. Maxwell think positively that each person will read this book is potentially great and can become great in every sector he/she loves. What it will be necessary to do once not anymore in our comfort zone is to be relaxed. Each of us can lose a battle, the important is to win this first step and start to live in a dimension in the past unknown. I also love that Mr Maxwell remembers God in a final chapter of No Limits. God is very important in the American society and the respect for God is to me the engine of the USA and the biggest blessing. The first section of only two chapters Though he’ll be 70 this year, John C. Maxwell is still going strong. No Limits, his latest book, gives readers an understanding of what drives him with lots of how-to on staying productive themselves long after one would expect their batteries to be drained. This was my least favorite John Maxwell book. It seems to be missing the passion he had when he wrote so many other books. As much as I truly respect Maxwell and his writing, this book seems forced. It seemed as he took so many of his best stories and tried to fit them into a productivity book. I really feel this was outside of his specialty. I applaud him for taking the risk but I'm not sure it paid off, for me at least. Another excellent book by my mentor and friend. John's wisdom and insight outlines excellent points for anyone to grow outside of their comfort zone. A motivational book - Review to follow. After just a few minutes of reading, I actually felt more optimistic. Plus, it was obvious to me that the author really wants to help the reader. NO LIMITS is not just a “think positive” book. It’s very much an ACTION book. In fact, at the end of each chapter, are a series of questions to ponder. The idea is to apply your own situation to the “Capacity” questions—and then take action. The author presents a list of “capacity” areas, and how best to improve them. If you’re not very creative, John has an entire chapter focused on improving creativity. Out of energy? There’s a whole chapter on that. Have trouble thinking deeply—better read the chapter on deep thinking. Keep in mind that there is a LOT to absorb in this book. I found it best to read some of the chapters, then pause to just let the points “sink in.” When I read the book, I bounced around a lot, selecting chapters that I thought would be most helpful to me. For example, I zoomed in on the section called, “Energy Capacity—Your Ability to Push On Physically.” Here, the author suggests ways to discover what is draining your energy, and then ways to find what boosts your energy. Well, that would have been a real ego-buster! So many books encourage you to step out of your comfort zone and work on learning new things. In this latest work by the management genius, Maxwell tells you how to increase your capacity by concentrat This review originally appeared on my blog at www.gimmethatbook.com. This book was given to me by my father-in-law who I have realized recently has a lot of faith in me and believes I can accomplish a whole lot more than even I believe. I have been doing a lot of self-reflection and evaluating of my career and life goals lately. In the last year I was part of a year-long leadership building program through work, and that really opened my eyes to what it means to be a true "leader". I also found through that program that people already regard me as one a lot more t This book was given to me by my father-in-law who I have realized recently has a lot of faith in me and believes I can accomplish a whole lot more than even I believe. I have been doing a lot of self-reflection and evaluating of my career and life goals lately. In the last year I was part of a year-long leadership building program through work, and that really opened my eyes to what it means to be a true "leader". I also found through that program that people already regard me as one a lot more than I realized. This book really solidified a lot of what I learned during that conference. It talks about how we have different capacities in our life that we need to actively work at to achieve. All too often people "float" through life and don't work on actually improving themselves and learning new things. This book is about how we can constantly build ourselves up and accomplish more in our life than we know. "You must get comfortable being uncomfortable." "Not everything that had to be done had to be done BY ME. If something was necessary but I didn't have to do it personally, I delegated it." "You can push team members in areas of choice, but you need to be patient with them in areas related to their background, experience, and skill." The only reason I give this 4 stars, and not 5, is that the author does a lot of name dropping and promoting of his other books throughout this book. He does it in a way that "makes sense", but for some reason it just started to bother me because it keeps going and going throughout the entire book. Have you ever wanted to become more successful or a better person? Are you stuck, looking for advice or just simply feel like you've reached your limits as a person and don't know any other way, well than I recommend you pick up this book "No Limits" by John Maxwell. He helps the reader begin to recognize areas in our lives where we cannot change the history, such as our family, birthplace or relatives, but we can change what we create. We are able to create our friends, homes, neighborhoods, jo Have you ever wanted to become more successful or a better person? 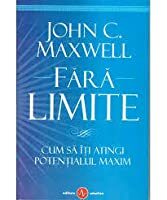 Are you stuck, looking for advice or just simply feel like you've reached your limits as a person and don't know any other way, well than I recommend you pick up this book "No Limits" by John Maxwell. He helps the reader begin to recognize areas in our lives where we cannot change the history, such as our family, birthplace or relatives, but we can change what we create. We are able to create our friends, homes, neighborhoods, jobs, etc. We can can create a better life and better self. What I love about this book is the ability to reflect at the end of each chapter with questions, which is perfect as you begin to look at the caps in your life. Maxwell also talks about our ability to possess energy, emotional, people, creative, production, leadership and thinking capacity, which all of these things help us with the choices in our life, which ultimately maximizes or minimizes our capacity, depending on what we choose. This book will help you choose whether you want to live in the moment or whether you want to think about the future. Maxwell challenges the reader about their thinking and to take responsibility for their lives by respecting oneself. Personal growth must be important, especially if you want to grow and live a better life. Age should be no limit to the life and capacity that is within each one us. However, if you want to grow, you will be challenge and you will step out of your comfort zone and Maxwell makes no qualms about that. Overall, I really enjoyed this book and the ability learn about the areas in my life where I could expand my capacity. I give this book 5/5 stars. Thank you to the Hachette group a division of Faith Words for sending me a review copy. A positive review was not required. I've been looking for a book on this subject for a while, and when I came across this book I was really excited. I am grateful to NetGalley for the opportunity to read and review this book. It felt like every word had been written exclusively for me. I am a huge fan of John Maxwell's books, but unlike most of the others I have read, which were more geared towards business executives, this book is for anyone looking to expand their capacity and achieve more with their life. I think it would make an amazing graduation gift for anyone stepping into the world, giving them essentially a tool kit to develop "success skills". Although many of the skills and topics touched on in the book have been written about elsewhere, the author bestows his unique perspective and draws on decades of experience. Anyone who reads the book will be inspired, not just to imagine more productivity and success, but will have concrete tools and action points to "blow the cap off their capacity". I think the content of this book is actually much better than 3 stars, but I listened to it on Audible and could not stand the voice of the narrator. I had to listen to it at 1.5 times normal speed just to tolerate his voice. He was so drawn out and slow in reading that it made me crazy. The content, however was fantastic for leaders. I felt like the focus was on increasing leadership capacity more than anything else, but it was a great book for self improvement and abolishing personal limitatio I think the content of this book is actually much better than 3 stars, but I listened to it on Audible and could not stand the voice of the narrator. I had to listen to it at 1.5 times normal speed just to tolerate his voice. He was so drawn out and slow in reading that it made me crazy. The content, however was fantastic for leaders. I felt like the focus was on increasing leadership capacity more than anything else, but it was a great book for self improvement and abolishing personal limitations. I think the author is a really good person and just wants others to be good, be helpful, and be their best selves. It did get a little old hearing about his age though. I bet he mentioned at least 50 times that he is almost 70 years old. Ok great - I get it - you turn 70 soon. I made notes on nearly every single page of this book. Maxwell masterfully gives practical advice on how to expand your mental capacity, your leadership capacity, your discipline capacity, etc. The one practical take away that I implemented right away is that when I hear a new idea that could benefit my life in anyway, I make a point to figure out a way to implement the idea and not procrastinate applying the knowledge that I learned. This way you become the type of person who acts immediately on I made notes on nearly every single page of this book. Maxwell masterfully gives practical advice on how to expand your mental capacity, your leadership capacity, your discipline capacity, etc. The one practical take away that I implemented right away is that when I hear a new idea that could benefit my life in anyway, I make a point to figure out a way to implement the idea and not procrastinate applying the knowledge that I learned. This way you become the type of person who acts immediately on new thoughts and creative concepts, which in turn makes you more open to creative ideas and act more quickly when you hear those ideas. One of my favorites? Spiritual Capacity -- your choice to strengthen your faith. Maxwell writes about HIS faith and tells the reader "if this chapter offends you? skip over it!" But he "HAS TO" write it. Why? Because his faith choice is inst John C. Maxwell never disappoints. In NO LIMITS, he explores capacity, limitations, development, emotions and many other factors of living with no limits! One of my favorites? Spiritual Capacity -- your choice to strengthen your faith. Maxwell writes about HIS faith and tells the reader "if this chapter offends you? skip over it!" But he "HAS TO" write it. Why? Because his faith choice is instrumental to increasing his capacity in every area of his life. He shares his personal relationship with God and how he hopes the same for his reader. Expands the perspective of our ability to be more successful! This is the first book I read of the author and I found it very warm and landed; the content is based on the process and mastery that he himself has experienced. It is written with an excellent balance between valuable content and interesting anecdotes, which allows a fluid reading. It conveys a very consistent message, excellently well articulated, there are no words of filling but relevant information, there is no doubt that it is a Expands the perspective of our ability to be more successful! This is the first book I read of the author and I found it very warm and landed; the content is based on the process and mastery that he himself has experienced. It is written with an excellent balance between valuable content and interesting anecdotes, which allows a fluid reading. It conveys a very consistent message, excellently well articulated, there are no words of filling but relevant information, there is no doubt that it is a talented communicator. The information made a very positive impact on me, it covers the subject masterfully from a very broad perspective towards a detailed, concise, very clear development, with valuable information. Everything is focused on providing us with tools for the development of all our innate capacity, not only for the talents we recognize but also for the ones we do not see or even talents that we want to acquire. It expands our perspective, since our conditioning generally allows us to achieve comfortably within a reality box, but the truth is that it only represents a fraction of what we are capable of. In the first part he provides information to help us to be aware of our capacities in the frameworks: physical-energetic, mental, emotional, social, creativity, productivity, leadership. It exposes an equation to maximize our capacity, in which we require to be aware, to develop our abilities and to execute the responsibility to make the right choices. The content is focused on the model of equipping people to help them work with their strengths. It then gives us valuable information to determine our "How", and focusing on each area to develop and take action, is how we break the limits of our ability. It is then that he explains to us in detail ten key areas, where through realizing life choices we expand our capacity, and to further expansion greater success in our lives. Way too scattershot of an approach to self-help writing. Each chapter is short, very general, and superficial. This book is basically a series of loosely related blog posts about improving in a variety of skills, talents, and "capacities" - but that approach limits the value that you can get out of any one section, and it seems to regurgitate a lot of advice from other writers and from Maxwell's other books. A substantial portion of the text in the book is direct quotes from other books, etc. the night before think of everyone you will be meeting the next day. how can I better serve those persons. if I think of ways to make their lives better, I will enhance everyone, myself included. Maxwell is 70. He doesn't consider himself at the end of his life or those last chapters but he lives with vibrancy and set his goals : 1M trainers in every country in the world. Initially, I felt this book carried similar themes to most other Maxwell books. He loves people, he is social, loves to dine with friends, wants to develop and grow others. I actually put the book down for some time. the last portion was far better, especially the chapters on abundance, intentionally, and spiritual capacities. if you're new to Maxwell, this would be a great introductions to his works. if you've followed him for years, this might be a good refresher of what he focuses on. A worthwhile read to get another perspective on things. Filled with intersting quotes and stories from well known people, this book does get you thinking about what else you can do do to enhance your capacity in numerous areas of your life. One distraction is the constant reference of the author back to previous works such as the 10 ways to do this or 15 laws of that...you get the feeling this is yet another regurgitation of previously presented concepts. Nevertheless, still worth the read. John Maxwell challenges me in his motivational writing to enlarge my capacity in every area of my life. John’s wisdom inspires me to live beyond my own limitation. There is no limitation in our life, we are the only one who set the boundaries to achieve more. A must read book for everyone who wants to be successful in their life. I found John’s book to be inspiring and insightful. I purposely read it slowly so that each day a little more of the truths it holds could sink in and motivate me to keep on growing. I know a lot of people think they don’t need to learn anything new after a certain age, well I just turned 65 and my goal is to never stop growing and getting better! I really found myself in this book. The things I needed to know to be a better leader. My Pastor chose this book for the leaders in our ministry to study as a group and it has been life altering. I recommend for any leader in ministry or anyone that is in leadership in a business. You’ll stay with it and it will stay with you. I absolutely love how I was able to find things that I needed to improve on roughly every other page. These concepts were represented into perspective through the most basic ways to understand where to change direction and start. This is a wonderful book about personal growth. And if you are a leader, about creating the environment for others to grow. In the author's word - to achieve your capacity. Neatly summed up in one simple formula: AWARENESS + ABILITY + CHOICES = CAPACITY. Did not finish. I love John's ability to motivate but for me in this season, it was too much "to do". I know this message will inspire a lot of people who need a plan and a push and might even be me in another season down the road! The usual great stuff from John Maxwell. Full of great stories that help illustrate and emphasis the point that he is making. Much of it though seemed to be somewhat redundant - maybe that is from reading nearly every one of his books. Some good pointers here though. Worth the read.